I too got semi ripped off this weekend on a craigslist deal. Lady had listed a 100 gallon tank (had the tank dimensions and everything) but of course no pictures. I go check it out and what do i find? 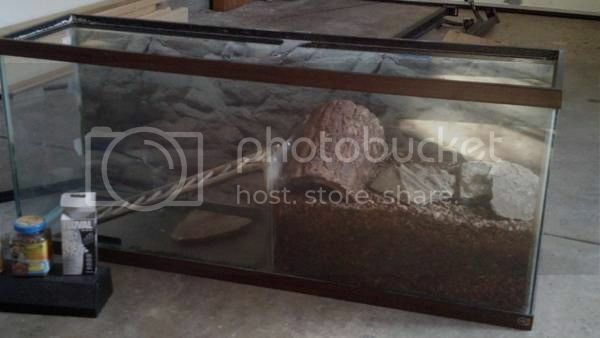 Its a 75 gallon.. Not only did it say 75 show clearly in 2 spots, the tank dimensions she listed were NOWHERE near what the real dimensions were. Thats when I noticed a few boxes hidden in the corner..
Thats when the only good came out if it. I found 2 brand new unopened glass tops and a brand new unopened light fixture for the tank. Had I not found those I would have been getting a pretty bad deal from this dumb craigslist seller. I agree its ultimately up to the buyer to make the decision if the seller is being untruthful about what there selling or not. TurtleLover_S&B wrote: Yeah, I'm a little leery on buying stuff online. One time my sister thought she was buying a purse, but they just sent her a picture of the purse, so it wasn't illegal. Kijiji is where we originially got Tut from and that was a great buy. Since then we have had a few good and a few bad. We have bought upgrade filters online and they were all good but the Rena eventually shot. So we found a 100 gallon tank on Kijiji with a turtle dock, gravel, a filter, fish ornaments and huge lava rocks.A gorgeous all black stand the exact length of the tank as well. We thought it was a great deal, oh and they delivered. there was no top for the tank, gravel was used in it so it needed a heck of a rinse. But then we bought the most recent filter, the Eheim 2217 on Kijiji, the guy delivered it, set it up for us, showed us there is absolutely no leaks, all part it came with except suction cups, and only for 150. So some are good steals, and some you should just stay aaway from. Hard to tell. R.I.P Frogger, Jumper, and Oscar. Craigslist is an excellent way to get what you need for a good deal. I do not agree with some opinions that those who sell on craigslist don't have to abide by common morality. No one wants to get screwed, so why screw someone else? (in the buying and selling sense of course ). Anyway I do agree it's risky business unless you do your homework. So far I have purchased my 55 gallon tank and stand as well as my recently acquired filter for a total of $140. Bringing someone along is always a good idea. If what they described doesn't hold truth then bargaining is the way to go. Once your there they just want to get rid of it so sometimes they will become flexible. I found what seems to be a good deal for a tank on Craigslist. I was wondering if someone with more experience with buying used tanks could check out the listing for me? 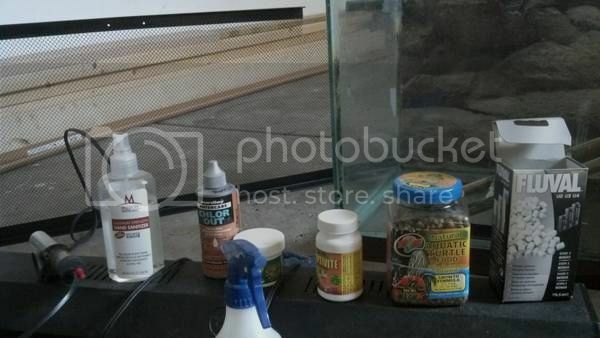 It says it is a 75 gallon tank with extras for $65/obo, and it has a neat DIY setup for a basking area which my RES really needs seeing as he/she keeps falling off the current spot (medium turtle dock). 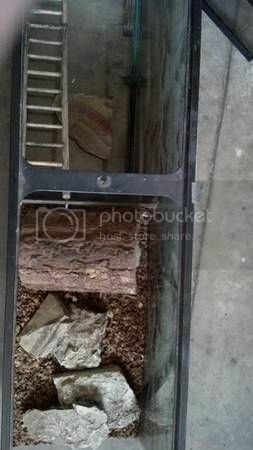 Could someone take a quick peek at these photos and the listing and see if anything stands out to them as being "not right"? I have an email in to the seller but no response yet. Any specific questions I should ask? I would really appreciate a keener eye on this. I'd pass. It's a narrow tank (wider is better for turtles), the built-in land area takes up too much space and the tank looks like it would need a lot of cleaning. You also need to check out the seals otherwise you will have major leaks. Petco occasionally has a $1 per gallon sale... I would hold out for the next one. Just to spin this the other way a little. I inherited my turtles from the same place I'm inheriting my insanity: My daughter. She brought them home from a trip to the City with her babysitter. They were about the size of a quarter and in a plastic takeout dish sized container. She was around six, and the sitter bought her the turtles to stop her from begging for more cotton candy. Apparently, like everything else under the sun, somebody in Chinatown has a little cart. From this little old lady with turtles, hermit crabs and tiny ziploks of food new famly members were aquired. . The first year the daughter was out in the yard every day looking for slugs and things that the turtles and her garden snake would eat. Since the second year I started to feed them and getting them ever larger tanks. Now they are my turtles and I like what's become of them. But, I remain pleased that our overly paternalistic mayor has made serious efforts to stop the sale of live animals from pushcarts. You can report the sellers via 311 (on the phone or online). They are slow to respond, but they will get to it... and sometimes they even do something about it.